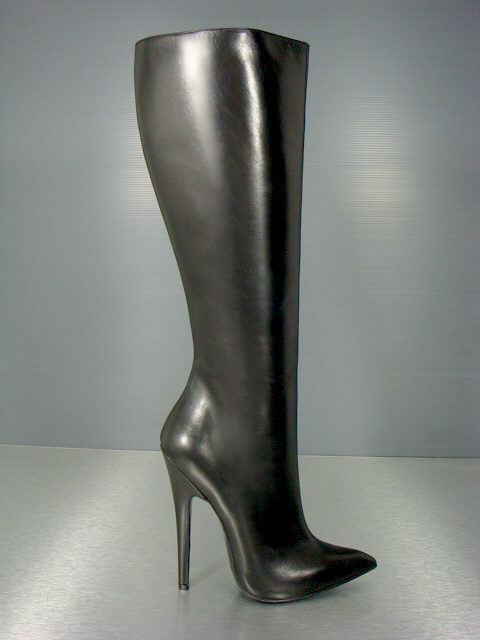 Hi Freddy, I uploads a couple of pics of my older calf length stiletto heed boots worn with trousers inside my boots. I can't see any new pictures? I doubt the stopping and chatting would happen over here, unless they were asking for money? These the sort of boots you have in mind? Still can't see any new piccies though? Those boots are circa €200/UK£150 plus carriage. The boots are nice. The outfit is fine. The only thing I would say is maybe a little too much black. I would chane the jacket or have it open with another colour underneath. I would say that if you focus a little more on the general outfit, more colors, more fashion, the heels will fit in better to the complete package. 6 pictures in total, found in gallery. No new ones, except the one 'jeans inside boots' piccy uploaded on the 12th of August?
" a couple of pics of my older calf length stiletto heed boots worn with trousers inside my boots"
I can only see the one? I'll have another look. Nope. 1 picture of jeans in boots? As long as I can see everything that's there, I'm good. But reads like there should be more, and I can't see it? there were only two with that upload. 3 uploaded on 21st May. All jeans over boots. 2 uploaded on 22nd May. 1 off jeans over sandals. 1 off jeans over courts. 1 uploaded 12th August. 1 off jeans inside boots. So I can only see the one recently uploaded image, of the jeans tucked into boots? Image quality is excellent, with the background less distracting than some others photo's, and looks to be quite a pleasant place to be at. The whole outfit/ensemble works well together. The colours and shapes all compliment. Not sure about the camera case? Being held like a handbag ... But the whole outfit really does work. If you went out walking dressed with boots on the outside of your jeans as your picture, you are a braver fellow than me. A write up of your 'adventure' or time out, would be very welcome. Thanks Freddy for your comments. I had one gent say to me ' like your boots'. Then later when I looked around, he had taken pics of me as well. On the same short walk, a small group of younger men were drinking, some were laughing when they saw my boots, then one ca,e over to a nearby fence and said ' excuse me, do you relies that they are women's shoes you are wearing?" I told him they were men's 'shoes' and very comfortable to walk in. So two event one short walk. You will olive the back ground even more buildings being demolished. The new pic look a lot better. A constant worry for me. That said, I have a (continuing) problem getting pictures of myself (and others) in heels, so I'm hoping the difficulty involved means possible 'snappers' are not going to be successful. Given the light levels in your picture, getting a photo of you in boots even at distance, would not have been difficult at all. While not being ironic, you are a trendsetter, and maybe should expect to be 'snapped' while carving your way as a fashion statement. As we've both said, you are a brave man.